1. John Tenniel, ”Humpty Dumpty” from Through the Looking Glass, London, 1871. Baltimore Museum of Art. 2. Jeff Kaufman, “Attention, everyone! I’d like to introduce the newest member of our family.” The New Yorker, 25 July 1977. © The New Yorker Collection. 3. Unknown artist, Martha Eliza Stevens Paschall, c. 1823. Oil on canvas. National Gallery of Art, Washington, D.C.
4. 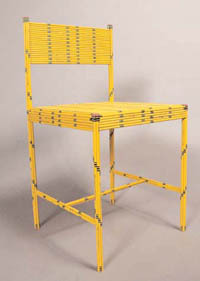 Jeremy Alden, 50 Dozen Chair, 2005. Painted wood-cased pencils. 6. Attributed to John Seymour, Jr. Portsmouth, New Hampshire, 1785–93. 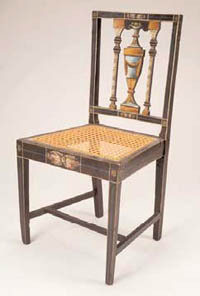 Birch with polychrome decoration; replaced cane seat. Baltimore Museum of Art. 7. Detail of figure 6. 8. Samuel Gragg, Boston, after 1808. American hardwoods, painted; with polychrome decoration. Baltimore Museum of Art. 9. Card Table. Thomas S. Renshaw and John Barnhart, Baltimore, circa 1815. Wood with polychrome and gilt decoration. Baltimore Museum of Art. 10. 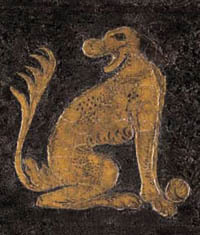 Gilt dog from High Chest of Drawers. Japanners: Robert Davis, William Randle, Boston, circa 1735. 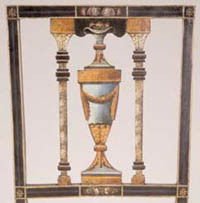 Maple and white pine, painted; with gilt decoration over raised gesso ornament; brass hardware. 11. Red and white queens from chess set, Chinese, circa 1800. Ivory, carved and stained. Baltimore Museum of Art. 12. John and Hugh Finlay (makers), and Francis Guy (decorator), Baltimore, circa 1805. Wood with polychrome and gilt decoration. Baltimore Museum of Art. 13. Detail of figure 12. 14. 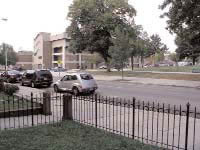 Site photo, looking west from Union Square, Baltimore, Maryland, May 2008. Humpty Dumpty sat on a wall [fig. 1]. Big mistake. But he made more than just a mess on the lawn. The familiar nursery rhyme uses reduplicative language – repeating the root or stem of a word, or at least part of it to achieve expressive, figurative, or iconic speech, a practice that happens in many tongues. Originally 18th-century English slang for a short, clumsy person, Humpty Dumpty gradually became associated with a range of disconnects in history, literature, and popular culture, from Cardinal Wolsey’s political downfall to Humphrey Chimpden Earwicker’s fragmented state of mind in Finnegans Wake by James Joyce, to a terrorist character in the Batman series, not to mention innumerable lyrics about broken hearts and failed relationships. He recently opened to mixed reviews in a Triple Shadow Company production in the East Village.1 These days, Humpty Dumpty even haunts the odd website. He’s everywhere! What has an anthropomorphic egg scattered all over the place to do with the extensive collection of historic painted furniture at the Baltimore Museum of Art? 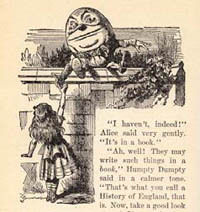 I am thinking about Humpty Dumpty’s semantic exchange with Alice in Lewis Carroll’s Through the Looking-Glass, and What Alice Found There (London, 1871). I want to suggest that, in a marketplace driven by constant innovation, visual history—like Humpty Dumpty—is easily fragmented. Furniture forms replicate the same functions over and over, providing seating, storage, surfaces for activities or display, and so on. Yet individual designs, materials, and decoration result in widely varied visual expression. Curators seeking ways to liven up a dreary period or style-based gallery might juxtapose pieces that seem disparate at first glance, putting ideas together again in a stimulating visual conversation between the old and the new. (Not sure I’d try this at home.) [fig. 2] Like words – chairs and tables, cabinets and clocks, can express many different things, particularly when we consider how they are ornamented, for whom they were made, who later possessed them, and how we view them now. I’m going to have a look and see what’s to be found. “Humpty Dumpty” first broke into print in 1810. He might have been better off perched, however stiffly, on a chair. Like Martha Eliza Stevens Edgar Paschall of Kaskaskia, Illinois, immortalized about a decade later as a bold set of disembodied shapes floating above a precariously tilted floor cloth [fig. 3]. About fifteen years of age at the time she was painted, Martha Eliza was about to wed General John Edgar, a man many years her senior. Less than another decade passed before the young widow Edgar brought one of the biggest fortunes in the Northwest Territory to her second marriage. 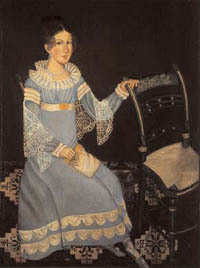 Her new husband, Nathaniel Paschall, was a previously rejected suitor; he had since left Kaskaskia penniless to become a newspaperman in St. Louis.2 A no-nonsense look in her eye, Martha Eliza clutches her reticule in one hand, with the other she firmly grasps the mate to the side chair hidden under her determinedly fashionable gown. Painted a rich green, embellished with brash gilt ornamentation, endowed with balloonshaped seat, the chair is easily recognized as a typical piece of American fancy furniture made for the popular market during the first quarter of the 19th century.3 Exuberant ornamentation has been melded with efficient, inexpensive construction incorporating ready made rush seats, uniform drilled and turned legs, styles, and stretchers. Were hers a magic carpet so that she could join us now, we might invite Martha Eliza to take a different seat. Perhaps, say, the 50 Dozen Chair [fig. 4] designed by Jeremy Alden in 2005 as a thesis project at the Pratt Institute in New York. This painted chair, too, addresses an efficient (albeit repurposed) technology. 50 Dozen is made up of six hundred mass produced egg-yolk yellow Dixon Ticonderoga #2 pencils glued together to combine lightness with surprising columnar strength. Martha Eliza well might recognize the pencil as we know it today. This long-popular tool for ephemeral writing has been manufactured in the United States using variations on the same process since William Monroe began sandwiching pencil lead between thin sheets of cedar to take advantage of the broken supply channels for British pencils during the War of 1812.4 Accustomed to erasing mistakes using a separate piece of rubber (the tree sap of Hevea brasiliensis, named by Joseph Priestly in 1770 for its ability to rub out graphite marks 5), she might be put off by the soft little tip glued into a metal cup at the end of each pencil. She was already a lady of a certain age when Hymen L. Lipman filed his patent for a pencil with attached eraser in 1858, and she might well have agreed with a complaint printed in 1861 about “that newfangled eraser, something between a hearthstone and a…knife-board” that would “rub its way through anything.”6 But matte pink notes created by eraser tips scattered rhythmically across the bright yellow surface of Alden’s chair are quite another matter; they are as satisfying as repeating scalloped forms ornamenting the hem of Martha Eliza’s gown. Alden himself comments, “I believe designers need to understand their materials – not just the physical properties but the cultural, historical, and social references.” These are far richer than those evident at first glance. 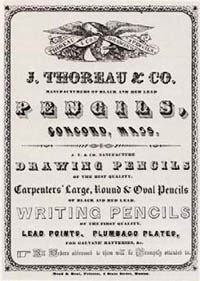 It was Joseph Dixon whose Ticonderoga line raised American pencil- making from a New England cottage industry into America’s industrial mainstream. And Henry David Thoreau, the son of Dixon’s associate John Thoreau, can be remembered not only for meditations at Walden Pond, but also for America’s best wood-cased pencils of the mid-19th century [fig. 5]. Not entirely committed to the family pencil business, which he finally gave up in 1853, Thoreau was far more interested in teaching.7 Alden associates his pencil chair with “elementary school, test taking, the smell of erasers,” but what he conceived is a spare and sprightly form that resonates with the elegance of painted furniture of the late 18th and early 19th centuries. Alden’s clever appropriation of extant technology and its festive yellow result points us toward another, slightly later ancestor, made by Samuel Gragg in Boston [fig. 8]. Dramatic load-bearing curves and the comforting name “elastic” in Gragg’s 1808 patent documents testify to savvy marketing of technology in the service of expressive design two hundred years ago. While the application of heat and moisture to shape pieces of wood dates back to the ancient world, it was chiefly used for ship staves and wheel rims until the 18th century. Gragg, whose father was a wheelwright, captured a fluid line with a pair of almost pencil-thin bent wooden elements that spring from the floor as front legs, continuing upward to bracket seat and back before ending at the crest rail. Five parallel stiles move in the opposite direction, forming the back by extending downwards from the crest rail, then becoming part of the seat itself. Generously shaped arms provide an additional set of counter curves for this abstract version of an ancient Greek klismos chair. The klismos, often sketched on ancient pottery vases and carved on marble memorial stelae, is a seating form much beloved by neoclassical designers with an archaeological bent. The name derives from a Greek verb, “klinen”—to recline. The year that Gragg patented his process, he enticed readers of the Independent Chronicle to visit the Furniture Warehouse in Boston’s crowded South End. 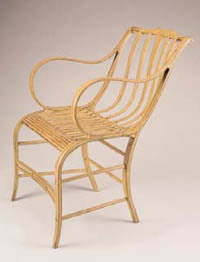 There, he kept, “constantly on hand, all kinds of Fancy and Bamboo chairs, of the newest fashion, which he offers for sale on as good terms as can be purchased in Boston.”11 The tawny yellow paint on his steam-bent chair has been further shaded to suggest split bamboo, an effect also evoked when a sheaf of yellow pencils is glued together to form a chair leg. The sheer exuberance of the Donnell table exemplifies the artistic excellence that gave Baltimore cabinetmakers an edge over competitors making painted furniture up and down the Eastern seaboard at the turn of the 19th century. The port city on the Chesapeake Bay blossomed as a bustling commercial center, and many talented cabinetmakers sought custom here.13 Among them, the English-born Finlay brothers created a flourishing enterprise, advertising furniture “in all colors, gilt ornamented, and varnished in a style not equaled on the continent.” These were to be had “with or without views adjacent to the city.”14 Working with John and Hugh Finlay between 1804 and 1806, Francis Guy was the artist responsible for the “views” of actual buildings that make these tables, benches, and chairs unique. Touching on civic pride, Guy’s pictorial decoration helped the Finlays attract Baltimore’s richest and most stylish patrons, at the same time blurring the distinction between “fine” and “decorative” art. The suite was not made for domestic use; rather it celebrated domesticity: genteel country life in elegant villas built on the hills surrounding the city. Originally the furniture stood in the Assembly Rooms, a public meeting place where the great and the good of Baltimore gathered for social pleasures doubtless mixed with business.15 A vignette of Willow Brook, the Donnell family’s country villa, ornaments one of the chairs [figs. 12; 13]. Like Willow Brook, most of the buildings depicted on the suite are long gone. Once later generations of Donnells initiated speculative housing development in the mid 1840s, their twenty-six acre estate began to disappear. A current site photograph of the spot where Willow Brook once stood eloquently rings the changes. [fig. 14] Today, the suite of furniture is on view at the Baltimore Museum of Art in the neoclassical yellow oval parlor rescued when Willow Brook was demolished in 1965. The Donnell family’s house lasted longer than most depicted by Guy; indeed only two of the structures that decorate the furniture survive today. One does not usually think of an armchair as an architectural document, but in many cases, Guy’s decorations are the only known images of early buildings. Before it was completely overwhelmed by urbanization, Willow Brook found itself confined to a single city block. The former villa served as a convent and home for wayward girls. Latterly, the West Baltimore neighborhood as it now appears has been used to film episodes of The Wire, David Simon’s serial police drama that captures a dark and brutal energy quite different from the entrepreneurial optimism of the city’s founding elite. 1. “Alice: End of Daze,” at La MaMa E.T.C., reviewed The New York Times, 6 May 2008, p. B6. 2. James H. Roberts, “The Life and Times of General John Edgar,” Transactions of the Illinois Historical Society, 1907: 12: 71-73. 3. For an overview, see Sumpter T. Priddy, III, American Fancy: Exuberance in the Arts, 1790-1840 (Milwaukee: The Chipstone Foundation, 2004). 4. The first “modern” pencils appear much earlier, in the mid 1500s, and like the history of American furniture, American wood-case pencil manufacture has its roots in Great Britain and continental Europe. Pencil-making emerged from the woodworking craft of joiners, who had the ability to shape and assemble small pieces of wood. For a definitive study see Henry Petroski, The Pencil: A History of Design and Circumstance (NY: Alfred A. Knopf, 1990). 5. In 1770, Edward Nairne, a shopkeeper at 20 Cornhill, London, first sold cubes of natural rubber for use as erasers. 6. The Pencil, p. 177. The eraser-tipped pencil was not universally popular until the twentieth century. 7. “An American Pencil-Making Family,” The Pencil, pp. 104-125. 8. Robert D. Mussey Jr., The Furniture Masterworks of John & Thomas Seymour (Salem: Peabody Essex Museum, 2003) , pp. 272-273. In 1785, John Seymour (1738-1819) immigrated with his wife and eight children from Axminster, Devon, to Portland, Maine. After his eldest son’s death, he moved to Boston in 1794. 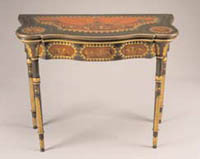 There, he and his son Thomas Seymour (1771-1848) created memorable federal furniture. 9. Joseph Paxton’s glass and iron building was the first example of modular architecture. All its structural members were exposed; Owen Jones painted them in a primary color scheme of red, yellow, and blue. See M. Darby and David van Zanten, “Owen Jones’s Iron Buildings of the 1850s,” Architectura, (Munich), IV, 1974, pp. 53-75. 10. George Heppelwhite, The Cabinet-Maker and Upholsterer’s Guide, 3rd ed (1794); reprint (NY: Dover, 1969), p. 2. 11. 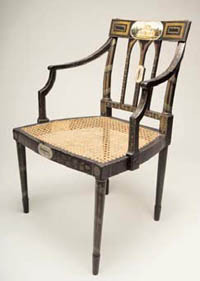 Independent Chronicle, Boston, 25 February 1808, cited Patricia E. Kane, “Samuel Gragg: His Bentwood Fancy Chairs,” Yale University Art Gallery Bulletin, vol. 33, no. 2 (Autumn, 1971), p. 33. 12. The house was actually built by Donnell’s uncle, Thorogood Smith; financial reverses forced him to auction the property off to his nephew. A still-extant neighborhood called Canton recalls Baltimore’s early trade with the East. Canton occupies land once owned by yet another merchant trader, Captain John O’Donnell (d. 1805), who brought the first shipload of goods from China to Baltimore in 1785. 13. Nearly two hundred cabinetmaking individuals and partnerships were active between 1760 and 1810. Baltimore Furniture: The Work of Baltimore and Annapolis Cabinetmakers from 1760 to 1810 (Baltimore: Baltimore Museum of Art, 1947), pp. 190-192. 14. Federal Gazette, Baltimore, October 24, 1803. 15. Lance Humphries, “Provenance, Patronage, and Perception: the Morris Suite of Baltimore Painted Furniture,” American Furniture (2003), ed. Luke Beckerdite (Milwaukee: Chipstone Foundation), pp. 138-212. DAVID PARK CURRY, senior curator of Decorative Arts, American Painting & Sculpture at the Baltimore Museum of Art, specializes in American and European art of the late 19th and early 20th centuries. Currently charged with reinstalling the BMA’s American wing, he is particularly interested in exploring cultural crossroads where art, decoration, and commerce intersect. Dr. Curry has lectured widely in the United States and England, and published on Homer, Whistler, Sargent, American Impressionism and Realism, folk art, Victorian architecture and decoration, world fairs, and period framing. His most recent monograph, James McNeill Whistler: Uneasy Pieces, was published in 2004. He is currently working on a contextual study of the Hayes presidential china as well as a short book on William Merritt Chase’s fish pictures.